Access resources for educators and professionals; lesson plans, posters on children’s rights and our website for young people. Our materials are suitable, and can be adapted for children aged 5-18 years. We have developed materials for educators to explore issues relating to children’s rights in Ireland with children and young people. Available in English and Irish, and written by experienced teachers, these resources are easily downloadable and adaptable. September 2017 marked the 25th Anniversary of Ireland’s ratification of the UN Convention of the Rights of the Child. The Ombudsman for Children’s office marked this significant milestone by inviting everyone to get involved and to celebrate ‘Children Now, Rights Now’. We have created a range of educational resources for teachers and educators to help teach young people of all ages about their rights and about the UN Convention on the Rights of the Child. 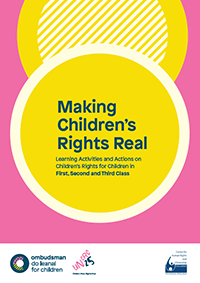 Making Children’s Rights Real is a suite of resource materials to support teachers in primary and post-primary schools to explore children’s rights with their students in the context of curriculum teaching and learning. The materials include an important focus on supporting children and young people to implement an action for children’s rights. 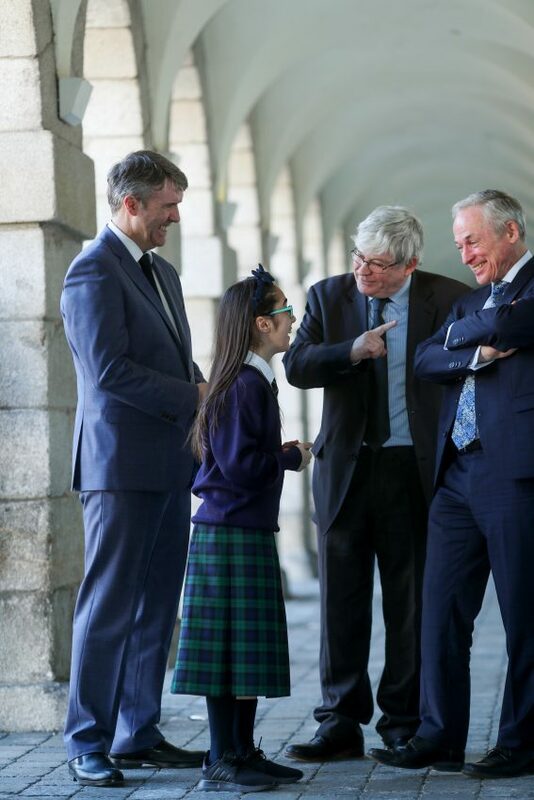 This online resource is a joint collaboration between the Ombudsman for Children’s Office and the Abbey Theatre. Act Your Rights aims to help children to become more aware of their rights and explore how rights are reflected in their everyday lives. It offers an innovative and enjoyable way to talk about rights with 4-6thclass students through discussion, drama and art activities. The resource consists of 5 sessions (2 rights sessions and 3 drama sessions) with downloadable activities/worksheets. We have provided Guidance for Teachers including general ‘comments and tips from Teachers’ and also ‘Drama tips for Teachers’ if you decide to do the ‘Make an Act Your Rights drama’. To further enhance the delivery of the resource, the Abbey Theatre can provide contact details for theatre facilitators nationwide who can deliver part/all of the drama-based activities. If you have any questions regarding Act Your Rights or require further information, please contact the Education and Participation team on (01) 8656800. To mark the 25th Anniversary of Ireland’s Ratification of the UN Convention on the Rights of the Child, the OCO has developed a range of new free online resources for educators to engage young people with rights in innovative and creative ways. The ‘Rights Museum’ resource invites 1st-4th year CSPE, Art, History, Politics & Society to explore the UNCRC and to choose and curate objects which represent rights of their choice to exhibit and share in a pop-up ‘Rights Museum’ in their school or local community. The Rights Museum resource was piloted with Larkin Community College, Dublin from September 2017 to March 2018 – led by Collapsing Horse Theatre and culminated in an exhibition at the National Museum, Collins Barracks attended by the Minister for Education Richard Bruton, Ombudsman for Children Dr Niall Muldoon and Director of the National Museum Dr Raghnall O’Floinn. For educators, the resource offers a unique approach to rights conversations with students, deepening their awareness of the UNCRC and their ‘rights in reality’ and it offers young people a unique way to explore their own personal story and history through objects of their own choice. The video gives a flavour of the pilot Rights Museum and the resource (online soon) provides details of how you can make your own Rights Museum. Tune In is a consultation designed by the OCO in 2016 to hear children and young people’s ideas on good ways for us to raise awareness and understanding of children’s rights among children and young people into the future. We have developed resource materials to assist schools, Youthreach centres and youth services to support children and young people to take part in Tune In. While we have concluded our official consultation, there is still an opportunity to consult with children and young people in your own setting. The materials and accompanying posters about the OCO and the UNCRC can be downloaded below. If your school, Youthreach centre or youth service takes part, we’d love to know the outcome. Get in touch with us via email to oco@oco.ie. Small Places is a series of educational materials developed by the OCO in 2012. Small Places aims to support children and young people to make connections between children’s rights, as set out in the UN Convention on the Rights of the Child, and their daily lives at home, at school and in their communities. What do you say? is a resource that explore issues relating to children’s rights. It includes references to rights in the UN Convention on the Rights of the Child and the Constitution. These activities were created by a group of practising teachers and have been developed to facilitate implementation of aspects of the curriculum. The materials introduce the role and work of the Ombudsman for Children’s Office and give children the opportunity to explore and discuss the following issues: Having a voice and being heard; Family and care; Health and wealth; Education; Play, leisure and recreation, and Inclusion. 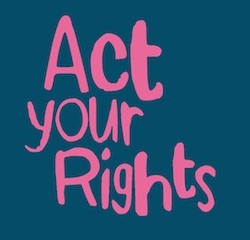 www.itsyourright.ie, along with its social media channels (facebook, instagram) is a website for young people that raises awareness about their rights. The website has lots of facts about rights. You can also find videos and audio of children and young people explaining why their rights are important. This site also has an ‘explore more’ section with resources for those working with children and young people so they can teach about children’s rights in their own setting.